My good friend recently introduced me to the world of organic beauty products and I've been hooked ever since. She's a connoisseur of all things eco and whether its recyclable packaging, synthetic free dyes or paraben-free ingredients she knows what's natural and fabulous. 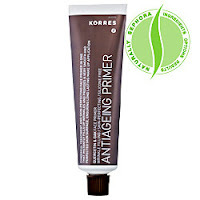 She herself is hooked and got me totally obsessed with Korres. 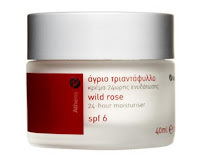 The Greek all-natural brand is based out of the country's oldest homeopathic pharmacy and uses environmentally friendly and skin suitable formulations. What I really love is how yummy and fragrant the main ingredients in many of the products are: guava, sugar, cinnamon and yogurt. Wild Rose 24-Hour Moisturizer SPF 6-This thick and creamy moisturizer feels like a slathering of cooling refreshment on the skin. I literally want to sigh in relief when the cream touches my face. It doesn't hurt that the unique blossom smell is equally soothing on my nostrils. This moisturizer feels cool and calming-great during the humid summer months. Quercetin & Oak Age-reversing Primer-I'm always looking for a great primer that will make my makeup last all night but still feel lightweight and airy on the skin. I think I may have found that with this amazing concoction. The primer settles into your pores-filling them so they're invisible to the naked eye and doesn't feel cakey or goopy on. 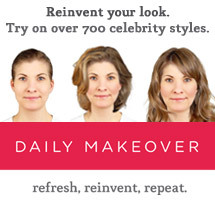 The anti-aging solution which uses Quercetin and Oak Age also keeps your makeup put and adds a luster to your skin. 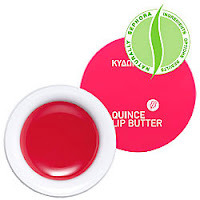 Lip Butter-is a rich buttery balm with a natural looking tint and amazing color range that gives your lips and cheeks a flushed look on. I opted for the sheer rose tint Quince, which gave my skin a warm 'rambling rose' kinda hint. The lip butter is soo soft and rich, it literally feels like its melting on your skin. This butter pot has a ton of color, softness and yumm texture for your lips! I can't wait to try their Lip Butter in Wild Rose, a sheer deep red. I do love my red lips. Korres Eyeshadows-have a beautiful light-collecting tint. The shadows contain sunflower oil to firm the eyelids and evening primrose oil for hydration and long-lasting wear. I love the shimmery hints in the colors I used together: a light Easter Bunny pink, a hot chocolate brown, a champagne colored rose and a golden yellow filled with hints of glimmer. Check out the colors and primer displayed by me: I added the colors from lightest to darkest and lined my eyes with the deep brown. I added a touch of the brown in the crease. I mixed together the lighter shades to create a contrasting light and dark, natural eye and put the light sunflower yellow shadow under the edge of my eyebrows to add more volume and depth to the eye area.